The quality of your esthetician magnifying lamp will greatly affect the quality of your vision when working with your clients, and we carry the highest-quality salon magnifying lamp models on the market. We feature only top-name lighted magnifying lamp manufacturers such as Daylight, Blu Woods and Omega. Our choices in LED magnifying lamp models are all sleek and ergonomically designed, built to last and with numerous options to make them as effective and as easy to use as possible. LED technology provides unequaled brightness to a low-heat magnifying lamp, and models such as the Daylight IQ Magnifier LED Lamp, with its 60 premium-quality LED bulbs, can be dimmed to four separate settings (20%, 40%, 55% and 100%) and the 7", 3 diopter lens can be easily swapped out without the use of any tools. Any of these illuminated magnifier models will provide unparalleled service to your salon. This 5" 2.25X (5 diopter) magnification quality glass lens is suitable with the 22020-01. Economy bracket for mounting your magnifying lamp to your steamer. Helps save space and reduce clutter in cramped facial rooms. Equipro superior quality adapter arm (bracket) designed to fit the Equipro steamer stand. This bracket provides a secure place for your favorite magnifying lamp and eliminates extra items on the floor of the facial room. High quality bracket allowing you to attach your magnifying lamp to your steamer. Perfect for the small facials rooms where space is of the essence. This 5" 2.25X (5 diopter) magnification quality glass lens is suitable with the 22020-01. 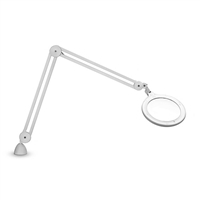 An LED magnifying lamp with adjustable light, metal frame, and clamp.